I do not have a single cookie recipe on this blog. Well, until now. It is not that I do not love cookies, trust me, I do. Having a mid-day cookie is my secret indulgence. I usually pick up a freshly baked one when I am grocery shopping and nibble on it while waiting to check out. Sometimes the checkout person asks me about the half eaten cookie "do you know there is only half a cookie in there? ", sometimes they giggle at my response, and sometimes they give me a look like "you couldn't even wait until you checked out to start eating that cookie". Michael knows all about my secret mid-day cookie indulgence. I think he finds it funny. So for my very first cookie recipe here, I thought it was appropriate to give you a recipe for my favorite cookie of all time. 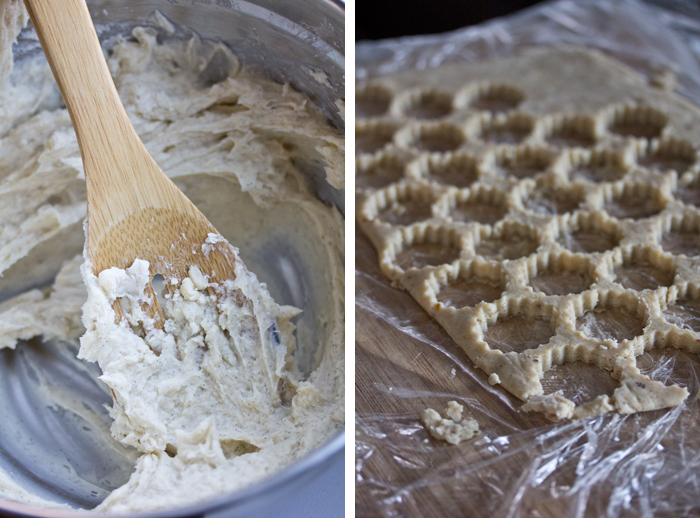 Hopefully you know me well enough by now to know that this cookie will not be your average shortbread. These little guys are both vegan and gluten-free. You're probably wondering how shortbread could possibly be vegan, well, I have a trick up my sleeve. Earth Balance. I use Earth Balance butter in place of real butter. I am not saying that this is a much healthier alternative to using real butter, but for someone like me who cannot have dairy (especially butter) this makes for a great alternative. If you tasted Earth Balance and regular butter side by side, you would never be able to tell the difference. As for the gluten-free part of this recipe, since I am fairly new to gluten-free baking I had to consult my favorite gluten-free chef, blogger, and cookbook author, Aran Goyoaga. You might remember I did a workshop with Aran back in September. Her gorgeous cookbook came out shortly after that, and it has since become a staple and reference guide for gluten-free cooking and baking in my kitchen. 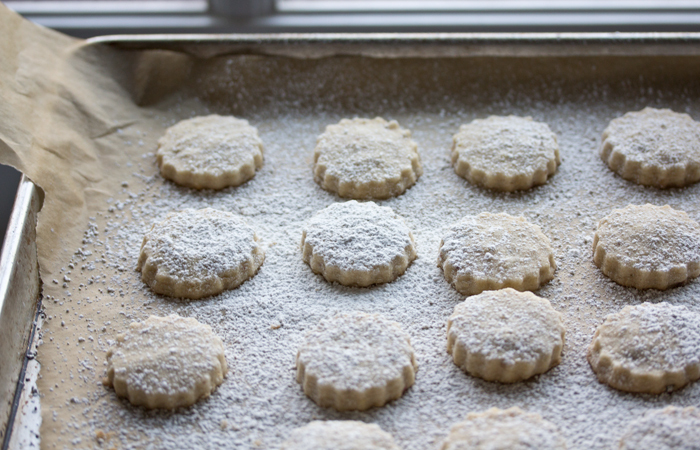 I have had her recipe for shortbread earmarked for some time, and since cookie season is in full swing, I have been playing with some variations of this recipe. She made hers with pistachios (which are wonderful) but I chose to share the pine nut version that I tried the other day. I just love pine nuts in cookies. I also took her advise and added the peppercorns. They add a subtle little peppery kick. 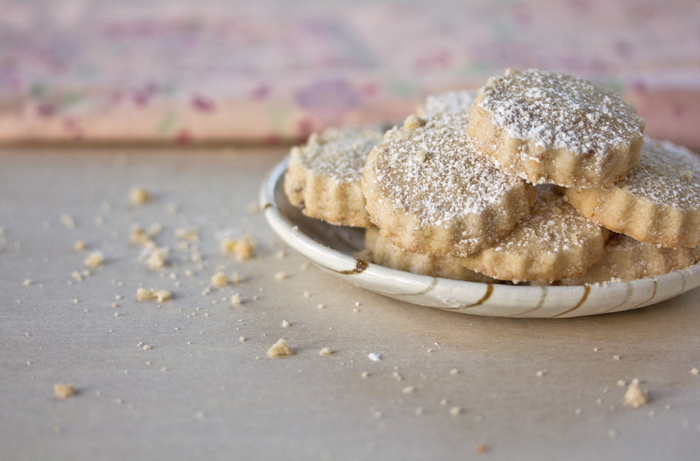 The peppercorns dress it up and make it a much more adult cookie. A really really good adult cookie.